Select the number of hardcovers you wish to receive in your order. The price will reflect the change in quantity. Select the outside color of your hard covers. Using a hardcover with too few, or too many sheets will produce poor results. Be sure to measure your expected thickness of pages to ensure you order the correct sized hardcover spine. We give you a rough estimate of page counts for each size. Have your covers imprinted with a foil stamp of your choosing. Some limitations apply, but our team will contact you once your order is placed to discuss your prints and create the order as specified. Create your own yearbooks from start to finish with Pro-Bind's Yearbook Binding Kit. Kit comes with just about everything you need to create your own hardcover yearbooks: a Pro-Bind 1000 Thermal Binding Machine, A Pro-Bind Hardcover Crimper, and 50pcs Hardcover Binding Spines designed for 8.5" x 11" paper. The hardcover spines are available in three different thicknesses (1/8", 1/4", 3/8") and available in four finishes (black, white, navy and maroon kidskin). Plus, the covers can be foil-stamped for an additional fee. Need more than 50 covers? You can definitely order some at a reasonable price. * Please Note: This kit may take up to 10 additional business days to ship due to the manufacturing of the hard cover. **Imprint Details: If you choose to customize your hardcovers with foil imprint or full color printing, you will need to provide digital graphic files to make the imprinting process possible. The provided graphic files must meet common desktop publishing standards such as minimum image resolution and proper color for your desired type of imprint. A foil imprint will be placed on the front cover, and will occupy a 20 square inch area (5"x4"). Additional custom imprint sizes and positions are available at additional cost. Choosing a full color printing option will place your graphic design across the entire outer cover. Our customer service experts will be happy to help you if you are unfamiliar with digital file requirements or any questions you may have regarding the customization of your hardcovers. Please expect at least 2 weeks for custom printed hardcovers to be produced in addition to shipping time. 50pcs Hardcover Binding Spines Designed for 8.5" x 11" Paper (Available in three different thicknesses (1/8", 1/4", 3/8") and four finishes (black, white, navy and maroon kidskin). Can be foil-stamped for an additional fee. If you need more than 50, you can definitely order some. This is the Pro-Bind 1000 Thermal Binding Machine! Now with thermal binding you can create you own custom soft or hardcovers or use plain standard ones. Now, open your thermal binding cover. Observe the glue strip in the center—you always want your pages within the width of this. You can see it easier on this hardcover. Make sure your pages do not exceed past this width. But it’s a simple as jogging your pages evenly together and inserting them against the glue strip. Close the book up, jog the pages again, and while holding the pages still insert the spine of your book into the machine. On the front, push the appropriate button—in this case I am making a soft cover book. It takes about a minute, and the machine will notify you when to remove the book. Jog the pages down again to make sure the pages settle nicely in the glue. It’s actually important that you place the book in the cooling rack until the glue hardens. This way you know the pages are always secured well. A nice thing about thermal binding is that you can bind several books at a time, depending on your size of books. The Pro-Bind 1000 can also bind together hardcover books up to 3\4 inch thick. Again, jog your pages evenly, align your pages against the glue, then ensure the pages are even when the book is closed. Insert the book with the spine down and push the “hard cover” button. This takes twice as long as soft covers. Now, for best results—and it is highly recommended for hardcovers—immediately after taking your book out of the machine, place it into a hard cover crimper until the glue cools. This way the pages are pressed together evenly and tightly within the covers. If you are looking for a very professional and well finished look for you books, then customizing a thermal cover may be exactly what you are looking for. 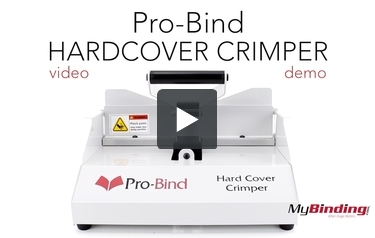 This is the Pro-Bind Hard Cover Crimper! After completing a hardcover heat cycle in you thermal binding machine, jog the pages down and immediately insert your hard cover into this crimper—of course I’m going to explain why. As you can see, push on the handle to open the crimper and insert your book. The crimper is rounded on both ends to create a nice finish on the spine of your book. You can adjust the back by pulling it out and repositioning it in the other slots. Now you can crimp up to two inch thick books! A good portion of hardcovers have three lines of glue. The one in the center holds all your pages in, and the two side ones helps hold the covers together. If you only had one strip in the center then your binding would open and expose the glued ends, but the side strips help close the spine and support the binding. (The crimper makes sure the book hardens this way). Here is a finished book, with nicely rounded and crimped ends, and you can see that the glue is hidden and the covers and spine are nicely supported. School will be back in session soon so it's time for all you teachers and administrators to start thinking about what supplies they'll need for the next year. One product that's definitely worth consideration is the Pro-Bind 1000 Hardcover Yearbook Binding Kit from MyBinding.com. Here's a look at its strengths and weaknesses. Check them out. 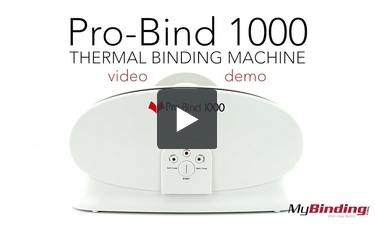 The Pro-Bind 1000 thermal binding machine, a device that warms up in just 3 minutes and offers one-touch operation. This machine can handle binding spines that are up to 3/4" wide, the perfect size for a number of different types of documents. Fifty hardcover binding spines. These spines are available in three different thicknesses (1/8", 1/4", 3/8") and four finishes (black, white, navy and maroon kidskin). These binding supplies are designed for 8.5" x 11" paper and can be foil-stamped for an additional fee. If you need more than 50, you can definitely order some. This package makes it possible for you to design your own customized yearbook in every way. You can use software programs like Photoshop and Quark to give your books the look you want. Using a kit such as this makes it possible to get students involved in a variety of ways: graphic design (including page layout), photography, writing, and so on. It's a great way to get students involved in something positive that will look great on their college applications. This package is reasonably priced and can be yours for less than $1,000.00. In a time of budget cuts and other financial disasters, a product like this can help you save money while still enabling you to create yearbooks that students will treasure for years to come. In fact, if you sent your yearbooks out to be printed, you would be paying about $60.00 to $100.00 per book. If you use the items in this kit, you can create a yearbook for about $15.00 a piece. Those savings are significant. The Pro-Bind 1000 can only bind one document at a time, thus this package is better suited for smaller schools (i.e. those with 350 students or less). However, it only takes one minute to bind a document, so you'll be able to bind a few hundred in a few hours. Overall, MyBinding.com's Yearbook Binding Kit has a lot to offer, especially smaller schools that are looking to save money on yearbook production. This package contains everything you need to begin working on your school's yearbook including the Pro-Bind 1000 thermal binding machine and a box of binding supplies. Using this kit will give you complete control over the entire process and you can even get students involved. Plus, this package will help you save a lot of money, even if you need to purchase photo editing and/or design software. To start creating your own yearbooks, pick up the Pro-Bind 1000 Hardcover Yearbook Binding Kit today. Does the binding kit comes with paper? If not, what kind to purchase? Thank you for your question. The Pro-Bind 1000 Yearbook Binding Kit does not come with any paper. For Thermal Binding you will want to use a uncoated non glossy standard bond paper. Paper stock that has a coasting is not able to form bind because the coating prevents the adhesive from being absorbed by the paper.